In the wake of the devastation left by the passage of Super Typhoon Haiyan through the central Philippines, liveaboard dive boat operator Worldwide Dive and Sail (WWDAS) was quick to weigh into the relief effort, ferrying supplies to remote communities inaccessible by land. 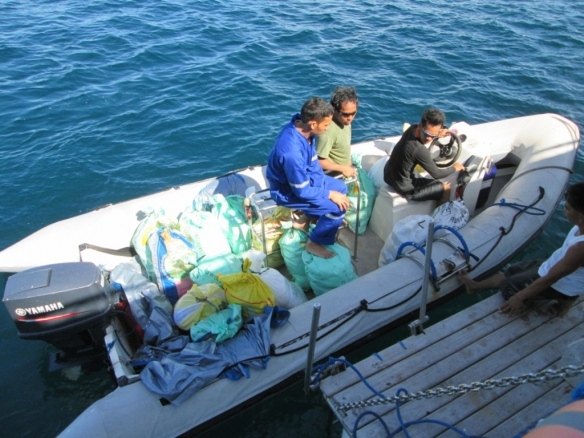 The first ‘mercy mission’ was to the island of Malapascua, a dive location renowned for interaction with thresher sharks, which took a direct hit from the storm. Local dive centre operators Sun & Fun and Sea Explorers requested the Siren Fleet’s help in getting supplies to the island, and sponsored the trip, working closely with global charity Medecins Sans Frontieres (MSF). 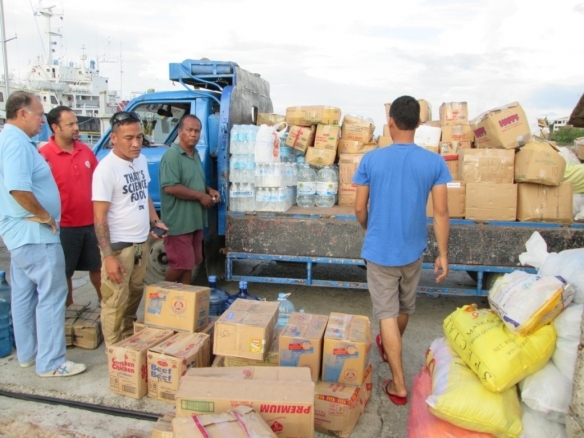 One of WWDAS’ 40-metre wooden phinisis (traditional Indonesian two-masted sailing ships) duly left Mactan on Thursday evening, arriving off Malapascua early the following morning carrying 15 tonnes of food, 16 tonnes of fresh water, blankets and clothing. 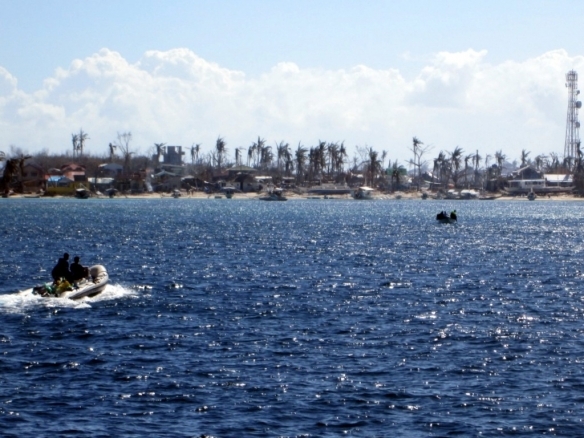 The trip was undertaken while awaiting official approval for a more substantial mission to Leyte Island at the behest of MSF. 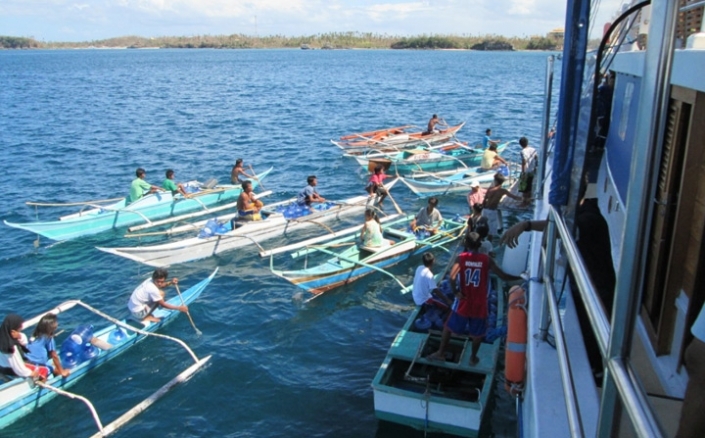 WWDAS keeps a phinisi – SY Philippine Siren – stationed in the Philippines year round, operating luxury diving trips. 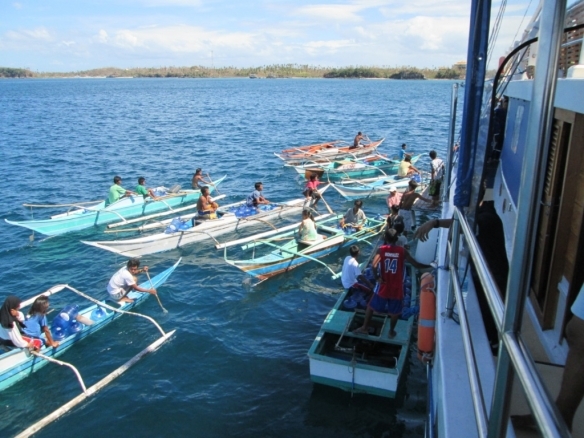 At the time the typhoon struck, a second and brand new boat – SY Philippine Siren 2 – had just arrived in the archipelago from the boat yard in Indonesia where it was built. 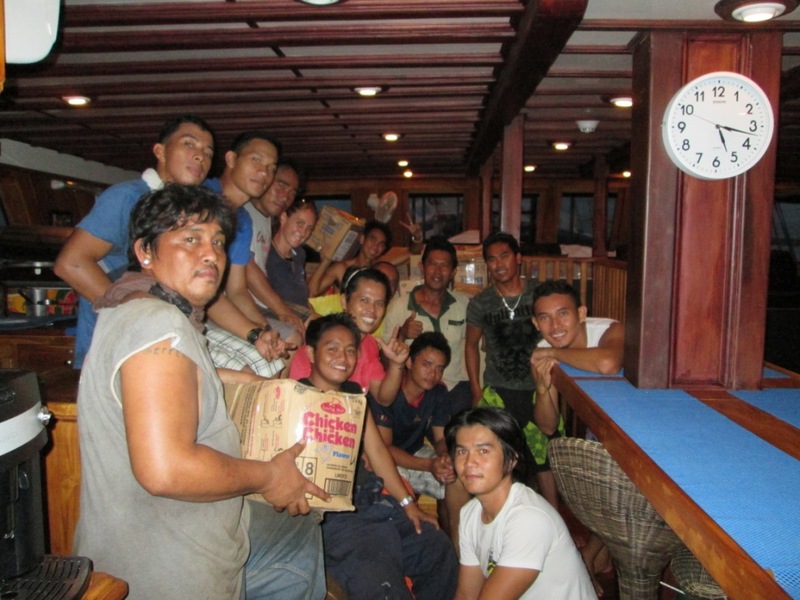 Both boats and their mainly Filipino crews took shelter in Cabilao and Negros when the storm hit and weathered the typhoon unscathed. 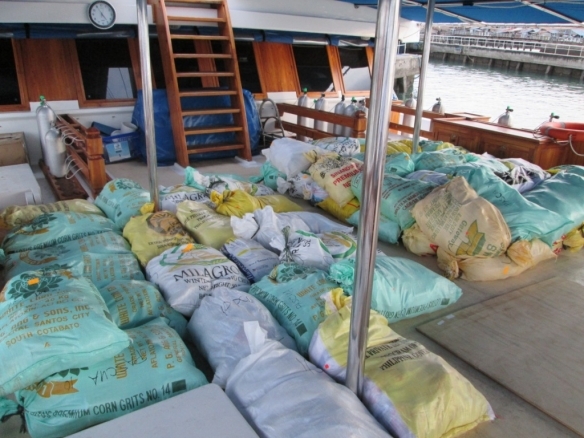 While the Philippine Siren returned to her tourism duties, the new boat, which was not scheduled to start commercial operations until late December, was enlisted to help with the relief effort. Philippine Siren 2 then returned to Cebu in preparation for the more extensive relief mission to Leyte Island in conjunction with MSF. 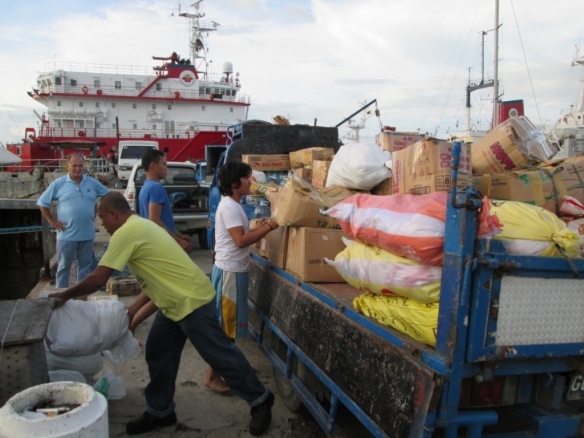 She left Cebu on Sunday night and arrived in Guiuan on the southeastern coast of Leyte Island early on Tuesday morning, carrying medical supplies, a small generator, gasoline and diesel supplies, and propane gas tanks as well as food and water to support the MSF operation there. In addition, the boat is equipped with two water desalination units capable of supplying some 12 tonnes of fresh water a day. 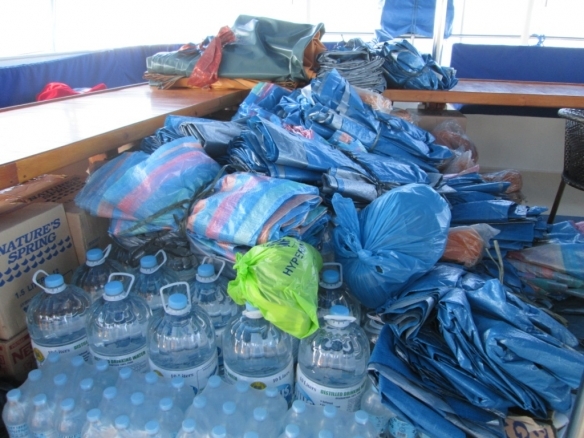 The boat was due to remain in Leyte until Sunday, acting as a temporary field base for MSF personnel where they are able to eat, rest and shower. Both Frank and his business partner Mark Shandur, who together own WWDAS, have first-hand experience in dealing with the aftermath of natural disasters. When the tsunami struck on Boxing Day 2004, Frank was diving in the waters off Phuket, Thailand, while Mark was in Sri Lanka, where he subsequently spent six months helping with the relief effort. They both recognise the harm done to recovery endeavours by the spontaneous dissipation of tourism in the wake of natural disasters, and urge visitors not to cancel planned trips to the Philippines. To that end, for sailings between now and 31 January 2014, WWDAS has committed to donate 50% of the trip price for all remaining berths booked on both Philippine Siren boats to MSF and the Philippine Red Cross. Busuanga airport was closed for a few days, but has now reopened, and although two trips have been re-routed to avoid Coron as a result, WWDAS hopes that by mid-December, both boats will be operating as normal. There are various ways to directly support recovery efforts through www.unicef.org and www.redcross.org, if you wish to make a donation. Thresher Shark Divers, owned and operated by Andrea and Trevor who are originally from the UK, are also personally assisting the recovery and have set up an online opportunity to donate by clicking here, if you’d like to assist the recovery of the local people from Malapascua Island. 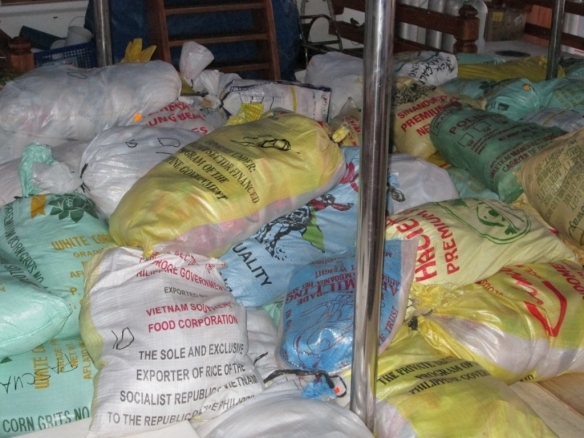 Funds are currently being used to provide food and water to the local Filipino people. Lissenung Island Resort, based in PNG, have set up another fund-raising campaign. Anyone donating A$50.00 or more will go into a draw to win an 8-night holiday at Lissenung Island Resort, incl. all meals, airport transfers, 6 dive days with 2 boat dives per day, return flights from Brisbane to Kavieng thanks to Dive Adventures (taxes not included) and a regulator, occy and snorkel package thanks to Scubapro-Uwatec Australia. MY FeBrina, based at Walindi Plantation Resort in Kimbe Bay, have joined the fundraising efforts by donating an 8 night trip on Febrina for 1 person in twin share accommodation, incl. all meals on board, 6.5 days diving and airport transfers, to a value of $3,365. Dive Adventures are also covering the flights for the FeBrina trip (from Australia to PNG), which brings the total prize pool to over A$9,000. So make a donation and go into the draw to win one of two trips, by clicking here. Author: Anne Paylor Anne Paylor is an aviation journalist who finally took the plunge and completed her PADI OWD in 2011. In July last year, Anne spent 10 days diving in Komodo National Park with Worldwide Dive and Sail, during which she completed her AOWD and Nitrox qualifications. She has also dived in the Mediterranean and the Maldives. If you have any other stories, updates and fundraisers for the relief effort in the Philippines, please share them with us.